This back to school teacher gift idea is a great way to welcome your teacher back to school. We love making gifts for our teacher to show our appreciation. You might enjoy browsing these teacher appreciation gift ideas. 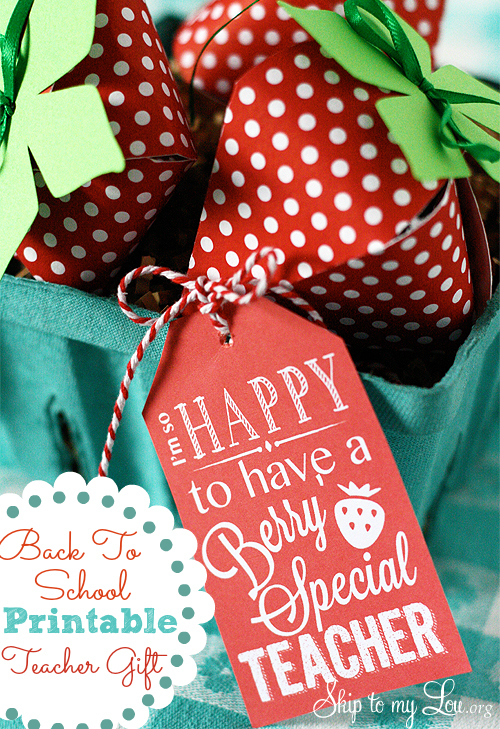 I even have some cute back to school teacher gift tags that make gift giving super easy! If you are looking for a cute saying to make your own be sure to look at these 50 Cute Sayings For Teacher Appreciation Gifts . All you need is a berry basket (I used the quart berry basket from Sweet! 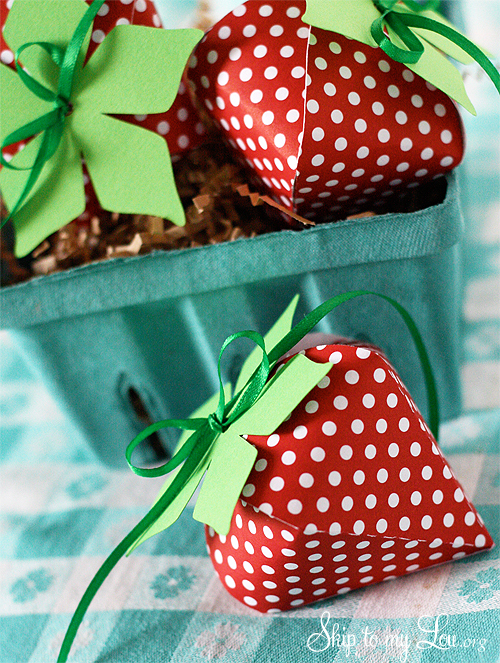 ), some ‘strawberries’, ribbon, candy to fill the berries and the printable gift tag. I made these little strawberry boxes with my Cameo. I downloaded the strawberry box from their website. I resized the berries to fit three on a 12″ X 12″ piece of patterned cardstock. I cut the leaves on a separate piece of green card stock. Tip: I used a tapestry needle with the ribbon doubled to sew through the top holes on the box. Make sure the ribbon is doubled so you can tie a bow on the top. Don’t have a Cameo no worries! Fill the basket with some chocolate dipped strawberries or strawberry shaped sugar cookies! Tie on the gift tag and you have a super cute back to school gift for your teacher! If you have to have a CAMEO be sure to try to win one! I have a giveaway going on right now! There is even a special promotion code- you can use “Skip” at check out to save on the CAMEO machine and BOGO Vinyl. My cameo and my red pindot paper are calling my name...i need to make these! I love these, Cindy! They are a perfect way to make strawberry cookies suitable for a back to school gift. Cannot wait to share! Where is the file for the tag? Love this idea!!! 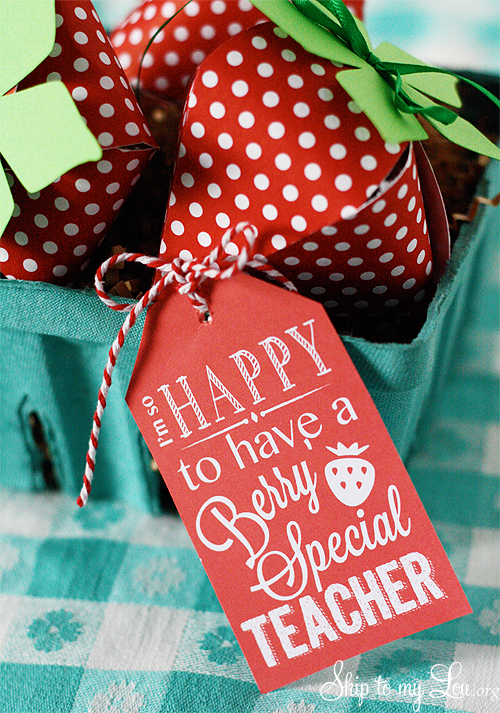 Hi Jill, click on the bolded title in the middle of the post that says Berry Special Teacher Gift Tag Download and it should open up and you can print. I printed in color on white cardstock. Let me know if you have trouble!